JEFFERSON CITY, Mo. (CNS) — Nineteenth-century German statesman Otto von Bismarck claimed that no one who respects the law or enjoys eating sausage should see either being made. Mike Hoey, who recently retired as executive director of the Missouri Catholic Conference, spent four decades at the grinder, working to reconcile Catholic principles with the perennial realities of forging public policy. “If we’re going to have a nonviolent civil society, we have to be willing to talk to people we don’t agree with — talk with them and work with them and at least try to reach some consensus and move forward,” he said. Hoey admits that he’s a bit less idealistic than he was when he came home to Missouri 40 years ago. But he’s a better listener, having acquired a thicker skin and the long view of a man seasoned by battle. Missouri’s bishops created the conference, the public policy agency of the state’s four Catholic dioceses, in 1967 to help people in the church advocate more effectively for foundational principles and the common good. Chief among these are the sanctity of human life and the inherent dignity of every individual. Coalescing consensus around these essentials and applying them to laws and policies can be slow, tedious and often beholden to the whims of history and public opinion. 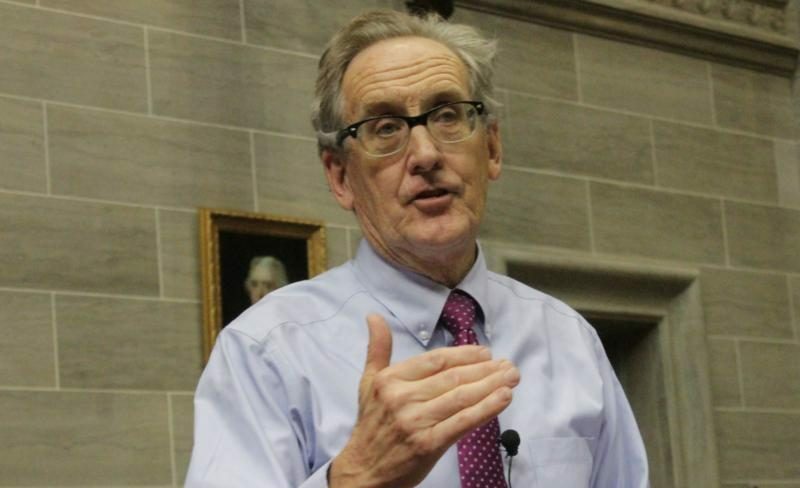 “Yet, there’s no alternative way to solve problems in a nonviolent manner than through negotiation and compromise and what we generally call the democratic process,” Hoey told The Catholic Missourian, newspaper of the Jefferson City Diocese. The Catholic Church has a wealth of teaching on a broad range of interrelated issues, such as protecting the vulnerable and helping people in need. As a lobbyist for the church, Hoey has found great satisfaction from some of the conference’s hardest-won victories. Among these are guaranteed access to special-education services for children in Catholic schools; A+ Scholarship opportunities for Catholic high school students; establishment of the Missouri Children’s Healthcare Initiative; and numerous ways of protecting society from abortion while providing life-affirming alternatives. He’s proud that the Missouri Catholic Conference remains a prophetic voice against the death penalty and in favor of a more restorative approach to criminal justice. Progress on each of these requires a combination of principle, persuasion, hard work, cooperation and patience. Some think taking part in such negotiations is a betrayal of non-negotiable principles. “But what you’re actually doing is advancing those principles to the greatest extent you can possibly get, in light of the circumstances you’re dealt,” he said. He recalled St. John Paul II’s declaration that when an all-out ban on abortion cannot be attained, an incremental approach to promote an abortion-free society should be pursued. Hoey said that approach applies to many other issues. For instance, the conference’s stand against the death penalty has been consistently strong. “It’s really about putting yourself in the other person’s shoes and trying to imagine yourself in the same situation,” he said. He noted that the church doesn’t condemn women who seek abortions but tries to help them in every way possible. When they were first married, Mike and Mary Beth Hoey went to a poor parish in Walsenburg, Colorado, to take part in a Catholic outreach program. While Mary Beth worked in special education, Mike got involved in parish ministry, spending many hours each week visiting individuals and families in their homes. After that experience with people who are poor and lonely, he looked for a way to combine his background in education, his passion for social justice and Catholic outreach to the poor, and his knowledge of politics and government. The Missouri Catholic Conference turned out to be a perfect fit. He joined the staff in 1979 and succeeded Louis DeFeo Jr. as executive director when DeFeo retired in 2000. He started out as a lobbyist and community organizer specializing in Catholic education. He also worked in rural life and family farm issues and later also got involved in health care and other issues. Hoey said his wife helps keep him spiritually grounded. He believes it’s important to keep praying and working for constructive dialogue among people of various religious, cultural and political persuasions. “Getting out of our comfort zone isn’t always fun but it’s very necessary,” Hoey added.